ALEXANDRIA,VA (July 27, 2016) – Today, the Marine Corps Scholarship Foundation, the nation’s oldest and largest provider of need-based scholarships to military children, announced it will award a record-breaking number of scholarships to thousands of Marine and Navy Corps families. For the upcoming 2016-17 academic year, the Scholarship Foundation will award more than 2,330 scholarships, valued at more than $7 million, which will provide access to affordable education for the children of Marine and Navy Corpsmen attending post-high school, undergraduate and career technical education programs. Founded in 1962, the Marine Corps Scholarship Foundation has been honoring Marines by educating their children for more than half a century, providing more than 37,000 scholarships valued at nearly $110 million. Headlined by Assistant Commandant of the U.S. Marine Corps, General John M. Paxton., USMC, the record-setting total will be announced during the foundation’s National Scholarship Announcement Ceremony at the at Marine Barracks Washington. During the Ceremony, the Scholarship Foundation will celebrate the academic and extracurricular achievements of the 2016-17 scholarship recipients, with a program that will pay tribute to our nation’s heroes while highlighting the widening gap between college affordability and military family income. “No matter when or where a Marine serves, the Marine Corps Scholarship Foundation is always faithful, committed to honoring that service if they ever have a son or daughter in-need – leaving no Marine family in-need behind,” said Margaret B. Davis, President and CEO, Marine Corps Scholarship Foundation. Within the next decade, more than 100,000 children of Marines will reach college age. Given the average family income of a Scholarship Foundation recipient is $59,000 – compare that to $92,000, which is the average cost of tuition and fees at an in-state, public college for four-years, thousands of military children face the prospect of being priced out of an education. The Scholarship Foundation’s scholars are on the front lines of America’s future. With a 90% overall graduation rate, 50% of scholars representing first-generation students, and over 45% enrolled in STEM and health science fields, the 2016-17 scholarship recipients outpace national performance averages in the classroom and beyond. About the Scholarship Foundation: Established in 1962 years ago, the Marine Corps Scholarship Foundation is the Nation’s oldest and largest provider of need-based scholarships for military children. 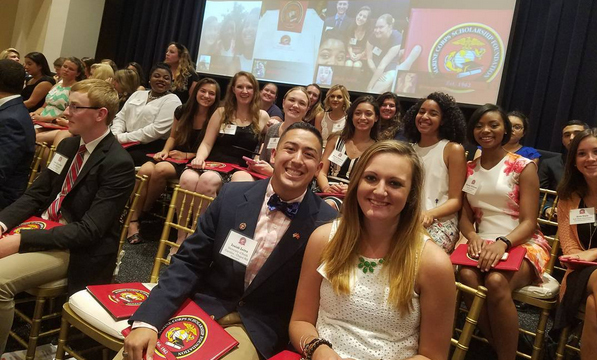 Since its inception, the Scholarship Foundation has provided over 37,000 scholarships valued at nearly $110 million to the children of Marines and Navy Corpsmen. For more information on the Marine Corps Scholarship Foundation, please visit http://www.mcsf.org/.